Last week marked the anniversary of the Sharpeville massacre which occurred during a protest against the pass laws. It ushered in increasingly discriminatory actions against Black South Africans, and can now be seen as the beginning of the end for the regime based on Apartheid. The South African experience suggests racial discrimination begins with the appropriation of wealth and power by one racial group and its consequent suppression of other groups in order to extend its wealth and power. The appropriation of power and wealth is naturally resisted by the existing inhabitants. In the course of struggle mutual incomprehension and fear grow, and the indigenous people are seen as strange, primitive, violent, childlike and less than fully human. This can be seen in the early pictorial representations of military or religious contact between native peoples and colonial representatives by Western artists. They leave no doubt which group has power and wealth, whether material or spiritual. After the dominant group has made secure its appropriation of wealth and power, it comes to assume that its dominance in these respects indicates its inherent superior capacity for power and entitlement to wealth. So the relations between the races are regulated in a way that provide lasting security in power and possessions for the dominant race. It controls and decides the fate of others; the native peoples are controlled and decided for. In South Africa the pass laws were designed to provide a reliable supply of cheap labour for industry, to ensure a homogeneous environment for white settlers in the cities, and security over the land they had occupied. In time as the initial conflict lessens and people have time for reflection these unequal and discriminatory relationships need ideological justification. Apartheid was just one of the more explicit ideologies. White and black peoples were seen as equal but different. So should each group have its own space, right down to separate park benches. The subtext, of course, was that one group of people was more equal than others. It was entitled to better conditions and could decide under what conditions other groups might live. Ideology usually leads to further discrimination because it allows people to act brutally with the shadow of a good conscience. In the name of apartheid millions of black people were forcibly moved from their homes into areas designated for them, pass laws were extended to cover women as well as men, and they lost what little rights they had to representation in Parliament. Ideology also leads to resistance both physically and on the level of ideas. Sharpeville is emblematic. 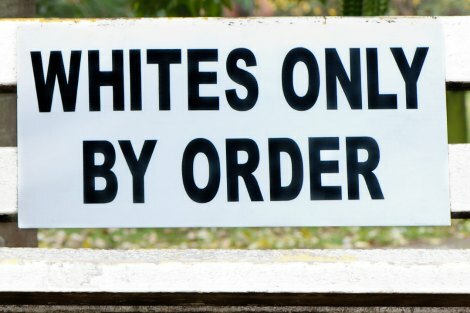 The South African example is one of the most radical modern examples of racial discrimination. But the link between power and wealth and racial discrimination is expressed in other ways, too. Racial prejudice, for example, is fed by the fear of losing power and wealth to a new and apparently favoured group. Prejudice against immigrants and refugees, particularly if they are distinctive by race, colour or religion, is often expressed by people who feel themselves to struggle and lack control over their world. These feelings, which are also found among the affluent, can be manipulated by those who wish to maintain control over power and embodied in policies that are racially discriminatory. It follows that if we are to address racial prejudice and discrimination we need to examine the way in which wealth and power are distributed and protected in society. In Australia, as in most Western societies, wealth and power are being concentrated increasingly in the hands of fewer people and corporations. It is defended by the ideology of competitive individualism in a free and unregulated market. The threat to the process and ideology does not come from minority racial, religious or ethnic groups but from public awareness and revulsion. This threat is often met by directing popular frustration at powerlessness and inequality against minority groups, such as asylum seekers, Indigenous people and Muslims. A government can then act severely to control these perceived threats, so distracting attention from the ideology whose partiality creates frustration. If this is so the response to racial discrimination must be primarily to build an economic and political framework based on respect for the human dignity of each person, and on the understanding that the economic order must serve the good of all, particularly the most disadvantaged. Andrew Hamilton is consulting editor of Eureka Street. Recent articles by Andrew Hamilton. In 2002 writer J M Coetzee spoke about the apartheid years in South Africa: "The peculiar cruelty and horror of apartheid was the very un-African aspect of it, a very rigid and ordered and in a sense European derived system imposed on a country and society to which it was really petrifying...It is the contrast between the particular ugly, banal, systematic, cruel horror in an environment which is so huge and so lavishly beautiful." South African writers and artists contributed greatly to public awareness about the horrors of apartheid. And so with the powerlessness of minority groups here, our writers and artists and activists can continue to write, paint and agitate. More and more people will listen. But Andrew, the economic order in the capitalist west is not meant 'to serve the good of all', let alone the 'most disadvantaged'. Rather, t is meant to maximise and then concentrate total wealth, and the power that goes with it, in the hands of a few. The condition of the poor then becomes the natural result of their congenital sloth, while its relief is the object of discriminating charity. It has ever been thus. thanks for this trenchant analysis and eye-opening reminder of a past that could become our future unless we act now. You know, when I read your second paragraph, I couldn't help but recall the accumulation of enormous wealth held by the Archdiocese of Sydney and the appropriation of power from the people that it gave George Pell and wonder how many times this situation is replicated universally. When Pope Francis urges the cardinals, etc, to come out of their palaces and give to the poor, does he really thinks this is going to happen because it would mean surrendering power which parallels accumulated wealth taken from the people, both rich and poor. These days, we are not in a position to criticise anyone. Andrew’s concept is too simplistic. Groups have specific that need to address other sensitivities, needs and cultural expectations. Part of Australia’s problem has been the selective bias of Australian historians and their anti-British sentiments. Pam is mistaken. Australian historians as writers and artists have not contributed greatly to public awareness, except to prolong a negative myth. Living with an isolated ‘Traditional Mob’ for 12 months made me realize how complex traditional Aboriginal problems are in choosing remote homelands. Their issues require totally separate answers to their ‘urban brothers’. Various Australian Federal governments of both persuasions attempted unsuccessfully to address, with integrity, monumental problems. The more radical ‘Aboriginal’ leaders impose a “New Imperialism” on their indigenous ‘brothers’ much as ATSIC did – and failed to do. Those who do not study history repeat it. This week's inauguration of Twiggy Forrest's Global Freedom Network — a large-scale interfaith initiative to end slavery — publicly recognises the importance of interfaith collaboration as a means of understanding and addressing social issues. Its launch comes not long after an Australian-first interfaith forum about the issue of forced marriage. It included Hindus, Buddhists, Christians and Jews, and discovered that forced marriage is not a Muslim issue. Asked whether they think the government's treatment of asylum seekers is right, some people will withhold judgment, arguing that the question is ethically complex; asylum seeker policy must take into account many issues, and an ethical judgment must await consideration of all these factors. This position is mistaken. The ethical questions are quite simple. The complexities and confusions arise only after we have answered them.